By Monday April 16, only two days before Kogalo were to play against Supersport United Gor Mahia still had not obtained tickets nor visas. It took the geneosity of Nairobi governor Mike Mbuvi Sonko to save the day when he donated 30 tickets. This after Sports minister Mike Achesa had refused to facilitate tickets. Then the intervention of Ababu Namwamba (Ministry of Foreign Affairs) enabled K’Ogalo to obtain Visas. Still it was too late to save the day for Ephrem Guikan and Tuyisenge who both missed the trip because their work permits did not meet the criteria required by the South African consulate. Gor Mahia officials have known for over a month that they would require South Africa visas. And fans have been posting online and in social media that previous Kenyan teams have had difficulty getting such visas. In fact the Kenya women’s youth team once camped at the South Africa embassy after the South African embassy started to make things difficult for their travel. Yet despite all the advance notice, no one in the Executive Committee saw it fit to start working on obtaining Visas and tickets. 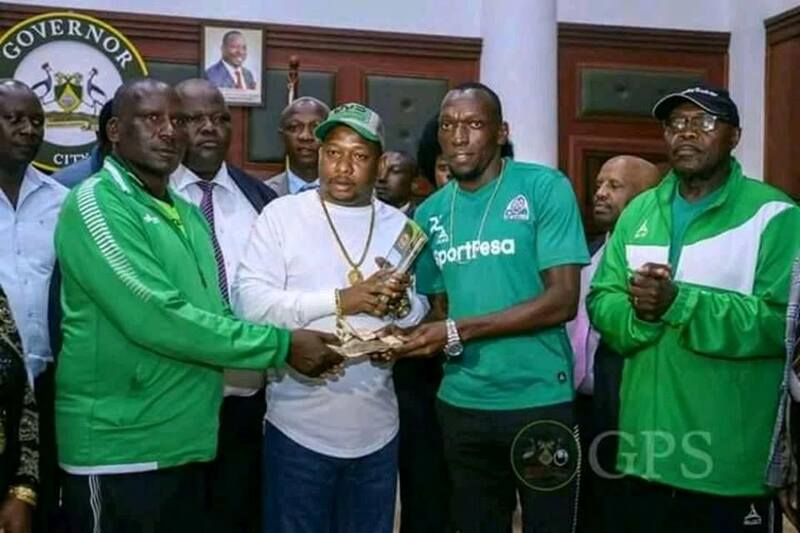 Had it not been for Namwamba, who likes sports and a Nairobi governor (Sonko) who is wealthy enough to donate tickets, Gor Mahia would have been disqualified from the 2018 Confederations cup and possible barred from competing in 2019. So Kogalo fans must thank Sonko for his generosity and Namwamba for coming to the rescue of the club. But Kogalo fans must demand better from the Chairman. How is it possible that he has been in power since 2008 a but has never seen it fit to change the constitution so the club is run by competent people? And how is it that Ludovick Aduda keeps getting appointed as CEO yet he has not proven competent? One wonders what qualifies him to be the club CEO and what if any accomplishments he has achieved. For years the club fans have asked for a competent person to be appointed as General Manager. This person should be in charge of the day to day affairs of the club including ticketing, visas, air-tickets, matchday tickets, accounting and so forth. Eventually the club can expand and start appointing another person to perform tasks like marketing the club, pursuing sponsorships and so forth. This person should be on a performance contract. The more money he brings into the club, the more money he should be paid. Let an established firm like KPMG perform the recruiting and hiring of these individuals. Gor Mahia has lost several international matches due to self inflicted errors. This is because our system of elections does not yield the best candidates. Its time to create a progressive constitution where competent people are hired to run the club. An independent body like KPMG should interview and hire these people. Left to Rachier, he will likely appoint Ludovick Aduda again. Kogalo was lucky this time that Sonko and Namwamba came to the rescue. If they continue like this then we might see worse during the group stage. Fans must now make their voices heard. We need competent people running the club. Thank you Sonko for saving the club at a crucial moment. And thank you Namwamba. Where would we be now? The point here is,we are into the group stages…the EC should plan ahead now not tomorrow!! Can admin edit before posting please? @Jamriambo……Gima wachre kanyo to winjre maber kendo waruako to onagi en ng’ama wacho Kisungu maler. Iluongo ni dho Wagunda. its time for us fans to shout loud enough to be heard.but we are demorolised because ‘this is Kenya’ where corruption tops,,..the beautiful ones are yet born.